J. Brandt Thorson was born in Houston, Texas on May 3, 1979. Brandt grew up in Bellaire, Texas, a small city in southwest Houston. After graduating from Bellaire High School in 1997, he attended Texas Tech University, where in 2001 he obtained his Bachelor’s Degree in Psychology. 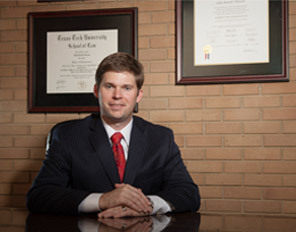 Brandt then attended the Texas Tech University School of Law, graduating in December 2003 with his Doctor of Jurisprudence. Brandt passed the Texas bar exam on his 25th birthday in May 2004 and was then admitted to the State Bar of Texas. Brandt is licensed to practice in all Texas state courts and the United States District Courts for the Northern and Eastern Districts of Texas. Upon his admission to the bar, the Gregg County District Attorney’s Office immediately hired Brandt and he moved to Longview. Brandt began his career as a misdemeanor prosecutor in the Gregg County Court at Law, and was quickly promoted to a position as a felony prosecutor in the 124th District Court. As an assistant D.A., Brandt handled all aspects of criminal prosecution in cases ranging from misdemeanor offenses such as theft, assault-family violence, and DWI, to all levels of felony offenses such as forgery, possession and delivery of controlled substances, burglary, robbery, felony DWI, intoxication assault, aggravated assault, sexual assault, intoxication manslaughter and murder. During his time as an Assistant D.A., Brandt was involved in more than 50 criminal jury trials. Brandt resigned from the D.A.’s office in May, 2006 and joined a Longview law firm as an associate where he handled the defense of criminal cases for the firm, as well as all aspects of civil litigation, family law, workers’ compensation claims, wills and probate and social security disability claims. Brandt has represented hundreds of clients in a variety of matters from the inception of their cases through trial in State and Federal Courts throughout the State of Texas. On September 1, 2012 Brandt opened his own law firm, J. Brandt Thorson, PLLC, located in Longview, Texas and focuses his practice on representing clients in criminal, family law, personal injury and social security disability cases. It is important that you have a lawyer who not only knows the law, but also has knowledge of how the local courts operate and knows the people who will be making decisions related to your case. Brandt is proud to be an East Texas lawyer. He resides in Longview with his wife and twin sons. He has devoted his entire professional life to building a law practice in East Texas where he can help you reach the results you desire in your case.